A test of outdoor warning sirens in Lewis County will take place this Thursday, February 7, at 10:00 a.m. 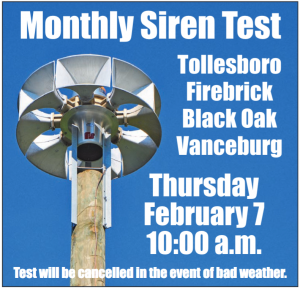 These sirens are located at Tollesboro, Vanceburg, Black Oak, and Firebrick. Judge Executive Todd Ruckel said the sirens at Black Oak, Tollesboro and Firebrick were purchased and installed in the last couple of years through funding from Department of Homeland Security Grants.